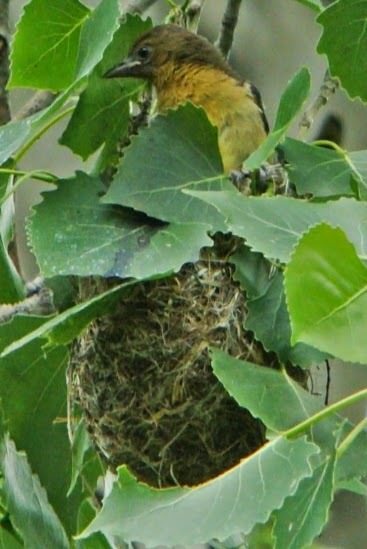 The Baltimore Oriole nest is built in three stages: first, the female weaves an outer bowl of flexible fibers to provide support. Next, springy fibers are woven into an inner bowl, which maintains the bag-like shape of the nest. Finally, she adds a soft lining of downy fibers and feathers to cushion the eggs and young. The end result is a tightly woven pouch located on the end of a branch of elms, cottonwoods, maples, willows or apples 23 to 30 ft above the ground. The female weaves the nest, usually 3 to 4 inches deep, with a small opening, 2 to 3 inches wide, on top and a bulging bottom chamber, 3 to 4 inches across, where her eggs will rest. She anchors her nest high in a tree, first hanging long fibers over a small branch, then poking and darting her bill in and out to tangle the hank. While no knots are deliberately tied, soon the random poking has made knots and tangles, and the female brings more fibers to extend, close, and finally line the nest. Construction materials can include grass, strips of grapevine bark, wool, and horsehair, as well as artificial fibers such as cellophane, twine, or fishing line. Females often recycle fibers from an old nest to build a new one. Males occasionally bring nesting material, but don’t help with the weaving. Building the nest takes about a week, but windy or rainy weather may push this as long as 15 days.